Arsenal set to seal £45.6million Karim Benzema deal Arsenal boss Arsene Wenger is set to sign Real Madrid striker Karim Benzema for a fee around £45.6million, according to AS. Arsenal boss Arsene Wenger is set to sign Real Madrid striker Karim Benzema for a fee around £45.6million, according to reports from AS. The reports from Spanish media believed that the French boss is keen to bring the French striker this summer. 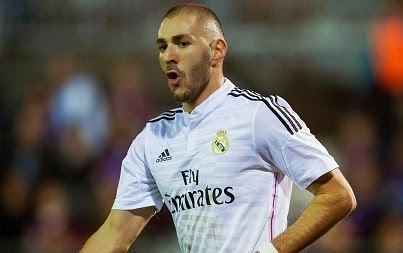 Benzema has been linked with a move away from Santiago Bernabeu for the past several months. The 27-year-old is expected to move to the North London side this week. AS claimed that Real Madrid boss Rafael Benitez is searching for a striker in the market as he eyes to replace Benzema. The former Liverpool manager has already said that the French striker is not a part of his plans and he could leave this summer. The Los Blancos have been linked with Paris Saint Germain striker Edinson Cavani. Benzema has netted 133 goals in 281 appearances for Real Madrid since his move from Lyon in 2009. Meanwhile on the other hand, Arsene Wenger has denied all the rumours linking Arsenal with Real Madrid striker Karim Benzema. However, AS believe that Arsenal are in strong link with the Spanish giants for Benzema move. Benzema was also linked with Manchester United who are now planning to sign Barcelona attacker Pedro Rodriguez.